Five fighters from the Bagot Street club had entered the tournament, three winning through the qualifiers in Littleborough to reach the finals. They were Nelson Birchall in the 44kg cadet class, Frank Varey at 44kg open class and Jake Abrol at 60kg open class, while Jack Dadak and Levi Barnes narrowly missed out. First up for Sharpstyle in the semi-finals was Birchall, who won a split decision against Yorkshire champion John Kerrigan from Steel City ABC. Varey faced an opponent a year older than himself in last year’s champion Alby Hill from Chadwell St Mary’s in Essex and Frank also won a split decision. Abrol won all his rounds against Harry Hillier of Southampton ABC for a unanimous decision. In the following day’s finals. Birchall was up first against familiar foe Alfie Hedges of the Pinewood Starr gym in Berkshire. Alfie had lost both their previous bouts narrowly but this time used good movement to evade attacks, countering nicely with fast combinations. Birchall’s movement made the difference as he won a split decision to be crowned national junior cadet champion. Varey’s opponent in the final was Bill Harbour from Greater London gym Bodyshots. Frank’s fast feet and range were too much for the game Harbour. Frank used his long jab to draw the attack, then neatly stepped out of range to counter. He forced a standing eight count on his way to a unanimous decision and another title for Sharpstyle. 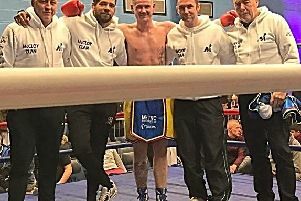 Abrol was up against Jude Moore of Downend ABC and was hoping to make it three out of three for Sharpstyle after a recent win over the Bristol fighter. This time Moore was awarded the split decision, though Abrol’s coaches felt he had won comfortably. The three Sharpstyle finalists will all attend a European selection camp, hoping to claim places in the England junior team to compete in Romania in May. A star-studded football match has been arranged by Blackpool fund-raiser 'Big Ry' (Ryan Smith) to raise cash to help Sharpstyle boxers to compete internationally. A Legends side packed with former Fylde coast professional footballers will take on Highfield Social in the Good Friday (April 19) match at AFC Blackpool at 7.45pm. Admission will be by donation.